We rejoined the New England Highway at Guyra and headed towards Tamworth via Armidale. Tamworth is actually quite a large town with good infrastructure including a big fully-stocked Coles supermarket where we bought some provisions for the rest of the journey. Tamworth is also the country music capital of Australia and hosts an annual country music festival which swells the population considerably. From the middle of Tamworth’s city-centre, we took Manilla Road towards the northern suburbs, turned right on Moore Creek Road and then right again on Moonbi Gap Road. Just after a property called ‘Gorundi Park’ which had some kind of horse show-jumping setup, we drove up a drive-way of a neighbouring property and parked about 500 metres from the confluence. Ada and kids stayed with car to have a picnic with the food we had just bought in Tamworth while I did this one solo. 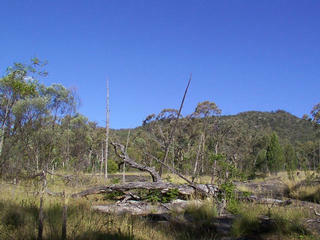 The confluence is in some rocky sloped bushland behind Gorundi Park.